Disney and Mickey Mouse Clubhouse and Fisher Price have come together to bring us Master Moves Mickey this Christmas. 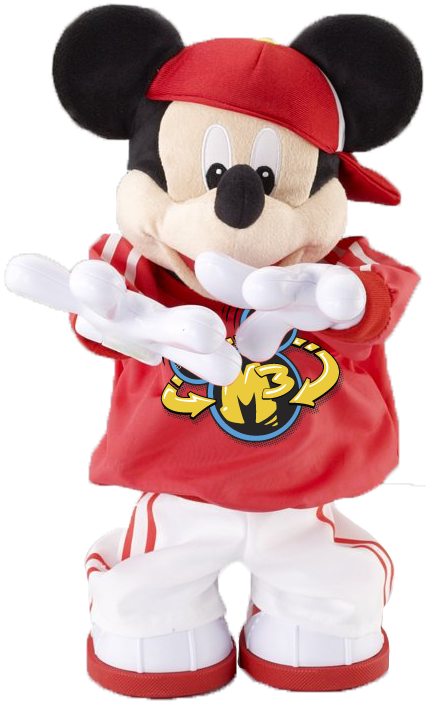 This Mickey (M3 as he's known to his crew) really does bust some moves in a Hip Hop Style! Mickey has a changed a lot since I was 7 years old and I had a Mickey Mouse watch where his arms went round! This Mickey has 8 original songs and knows 15 original dance moves, including the Windmill (I'm sure I was known for doing that one in my day!) and The Insane Headstand! He's suitable for children aged 2 and over and I'm sure once Isla catches sight of him during the Ad breaks on children's TV he will be in her sights as a Christmas present. He's sure to get the kids up and dancing and if Noah has anything to do with it that means we have to get up too, he's forever saying 'Up, up' when I'm sitting down and he wants me to join in! If anything I think this could be a great way to encourage exercise for all the family and it's cheaper than a Wii Fit! To inspire you to get on your own Mickey Dance journey the Master Moves Mickey Website is offering your child the chance to win £1000 and a bundle of Mickey Mouse Clubhouse toys. All you have to do to be in with a chance of winning this fantastic prize is film your children throwing some great dance shapes, make it as hip hop or as unique as you like! Upload the video to Youtube and then post your Youtube link here. Take a look at some of the entries to get some inspiration - there's some energetic Mickey impersonators out there! Good luck!